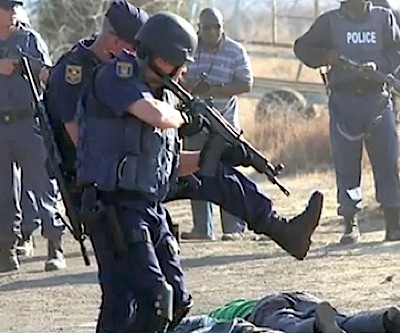 A commission of inquiry has accused South African police of lying about the tragic incident that cost the lives of 34 striking miners shot and killed at platinum miner Lonmin's (LON:JSE) Marikana mine, in August last year. In a statement released Thursday, the commission said it has discovered that police falsified or withheld documents and gave false accounts of events. Officers had said most of the miners died when they opened fire as the strikers charged them. But witnesses and journalists have questioned the police’s account ever since. At one point prosecutors tried blaming the surviving miners with the deaths of their colleagues, which has been qualified as the most deadly action by police since the end of apartheid in 1994. Appointed by South African President Jacob Zuma last year to investigate the deaths of the 34 miners, the Marikana commission obtained access to police hard drives and previously concealed police documents only 10 days ago. "We have maintained documents which the SAPS (South African Police Services) said were not in existence…"We have obtained documents which in our opinion demonstrate that the [police] version of at Marikana…is in material respects not the truth," the commission said. The group is reviewing the "thousands of pages" of documents found, and it is also seeking to obtain access to additional hard drives and electronic records. Not a single police officer has been arrested in connection with the event.